Pollux, also called Beta Geminorium, is an orange giant located in the constellation Gemini 33.7 light years away. 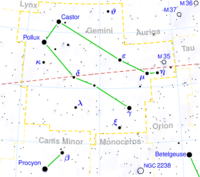 Although Pollux has the Bayer designation of Beta, (Castor having the Alpha designation) it is actually the brightest star in the constellation. Pollux is the 17th brightest star overall in the night sky with an apparent magnitude of 1.15. In 2006 it was confirmed that Pollux has one known extrasolar planet in orbit. The name Pollux is based on the twins Pollux and Castor of Greek mythology, who were the twin sons of Zeus and Leda. The original name in classical Greece for Pollux was Πολυδευκής or Polydeuces. Ptolemy though liked to refer to the star using the word ὑπόκιρρος, which described the star as "yellowish" or "reddish", and not as a formal name. In Arabic, the star is called الرأس التؤام المؤخر or Al-Ras al-Tau'am al-Mu'akhar, meaning "The Head of the Second Twin". Pollux is an orange-red giant with a spectral classification of K0 IIIb. The star is 8.8 times the diameter of our Sun. However like all giants, it has a low mass - being only 1.7 times as massive as our own star. Pollux is 32 times as visually luminous as our Sun, with a total luminosity 46 times as great when accounting for the infrared. As a cooler class K giant, Pollux has a surface temperature of around 4,770 K. The star has a metallicity (abundance of elements heavier then hydrogen and helium) between 85 and 155 percent of that of our Sun, based on the abundance of iron measured. The star itself has used up all its core hydrogen fuel and has shifted to fusing helium in its core to carbon and oxygen. This lose of mass will puff out from the star as a planetary nebula, consisting mostly of hydrogen and helium, with some heavier elements (such as carbon and oxygen). Once this occurs, the resultant left over star will be a white dwarf. Pollux has one confirmed extrasoloar planet in orbit. The planet, unofficially called "Polydeuces" was first detected in 1993, but was not confirmed until June 16, 2006. Polydeuces is a Jupiter class gas giant with a minimum mass of 2.3 times Jupiter's. The orbit of Pollux has an average distance of 1.64 AU, and takes around 1.6 years to complete. For an Earth-like world to have liquid water on its surface, it would need to be centered around 5.7 AU from Pollux, equivalent to Jupiter's orbit of the Sun. ↑ 2.0 2.1 Gemini Constellation. Retrieved on 2018-12-22. ↑ From definition of absolute magnitude, using apparent magnitude (+1.14) and distance (33.78 ly) given here. ↑ Pollux. Retrieved on 2018-12-22. This page was last modified on 22 December 2018, at 09:31.